I’ve owed you guys this recipe for ages now, but thanks to a reminder from reader Karen, I’m actually posting it! Here it is – my recipe for Marinated Kale! It’s so easy (no cooking! ), tasty and healthful – give it a go! What does it taste like? Well, kale to me, in general, is sort of like spinach except with a much heartier texture. Spinach is tender and bruises easily while kale holds up nicely (which is why a lot of recipes ask you to “massage” the kale – it tenderizes without bruising). Once marinated, the kale will soften up a bit, but it will still have a bite to it, texture-wise. The flavor mostly comes from the sauce ingredients, which end up being salty yet sweet with the lovely flavor of sesame oil ever prevalent and bits of fresh garlic and ginger popping up here and there. Anywho, I LOVE to make a big batch of this to start a week. It’s an easy side veggie to take to work – just pack some into a tupperware – no re-heating necessary. You just need a fork! Makes a great vegetable serving. 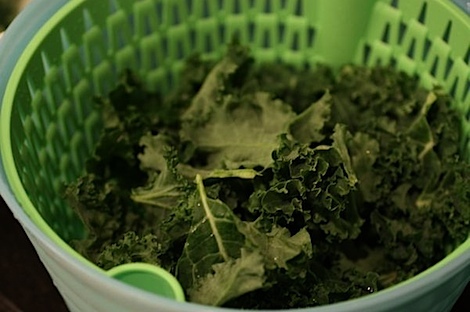 Be sure to triple wash your kale – it’s usually pretty gritty when you get it home from the store. I usually tear my kale into smaller pieces with my hands while I’m doing the washing part, but you can also chop it with a knife. Other key ingredients: Tamari, Sesame Oil. 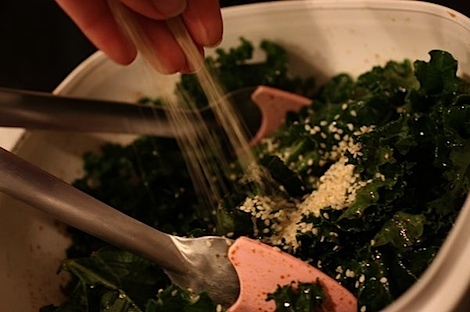 Add sauce to kale and massage – preferably with your hands. Why? Well, it seems like you can get away with using less sauce if you just rub it in a little. 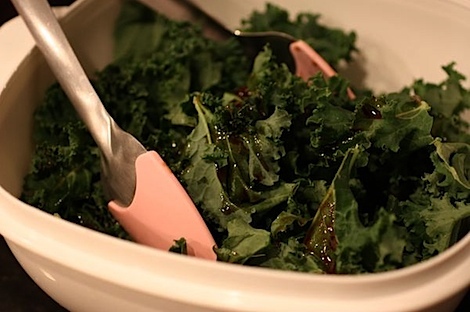 I believe most people massage their kale to tenderize it, but I just like to ensure my kale is well-coated without being in a puddle of sauce. 1-3 tbsp sesame seeds depending on how much you like them. 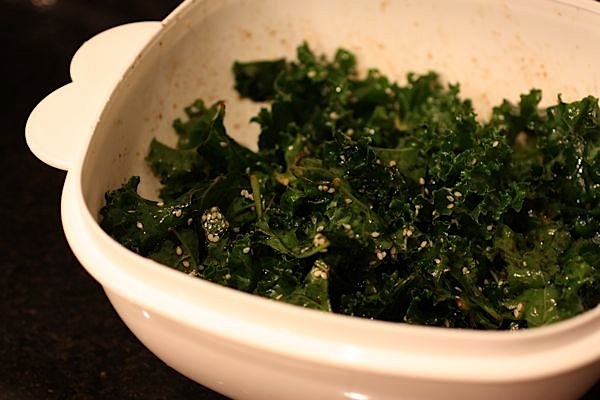 Place prepped kale into a large bowl. In a separate small to medium bowl, whisk together sesame oil and tamari till emulsified/combined nicely. Whisk in garlic and ginger. 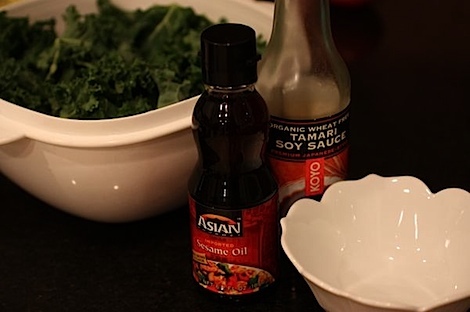 Pour sauce over kale and massage sauce into the kale (this will help ensure all pieces of kale are covered. Add sesame seeds to the kale (if you’re not sure if you’d rather go 1 or 3 tbsp, I suggest adding 1 and mixing up and checking coverage. You can always add more sesame seeds but you can’t take them back out…not easily at least). Store in an air-tight container. NOTE: You may wish to make your kale the night before you want to eat it so it has time for the flavors to combine. What a great recipe! The only problem is that I struggle to find kale in Australia! What a great way to have kale. I always think adding a pop of extra flavor to veggies makes them really enjoyable. Okay, I am going to try that. Never have. And it looks easy and healthy. This looks delicious. I’ll have to try it with spinach as kale is really hard to find here in Japan. Thanks for the recipe! 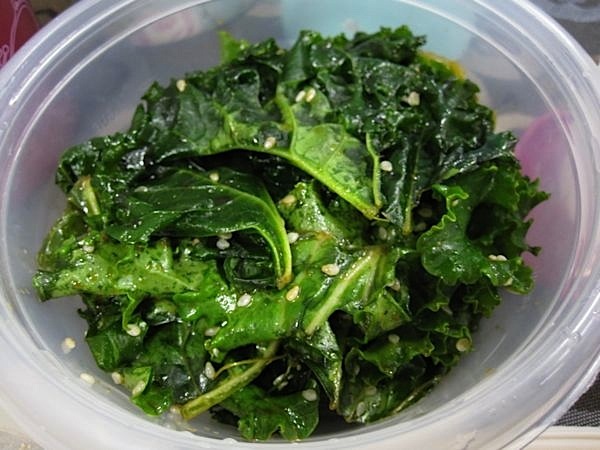 I am totally IN LOVE with the marinated sesame kale from EarthFare, and would like to make the dish at home. According to the ingredient list (from my many deli packages of purchased sesame kale from EarthFare! ), this recipe sounds like a perfect replicate winner! Bought kale last night, and cannot wait to try your recipe. Thank you! Great looking, simple recipe! We’d like to feature it on our Facebook page July 6, with a link to you, so people can come here and get the recipe. Hope you get some visitors from us. Please LIKE us on Facebook. We <3 Kale! I had marinated kale for the first time at the Veggie Grill in LosAngeles when traveling for business. I had them switch out the romaine in the salad for marinated kale. It was outragiously good! My web search for the marinated kale led me to your web page. Your recipe is wonderful! 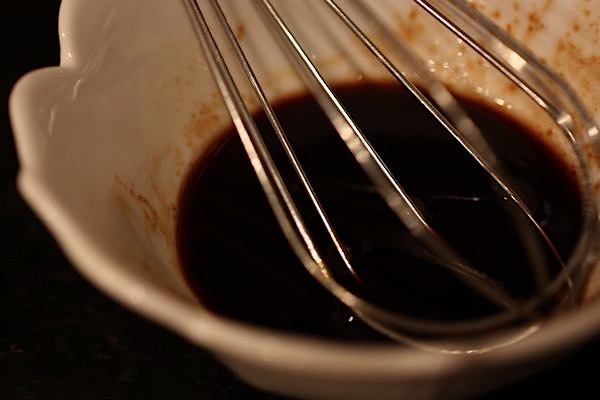 However, in my pursuit to make it like the Veggie Grill recipe, I also found a simple Thai Plum Dressing recipe: 2TBS plum sauce, 2TBS apple cider, 1/3C Peanut oil, salt and pepper (and I added a few drops of hot chili sauce). So, I made your recipe then I added the Thai dressing, mandarin oranges, crispy fried onions (since I could not find fried wontons at the store) and cilantro to the kale. It was so good, I didn’t wait to add the other ingredients to the salad before dinner was served! (grilled chicken seitan, purple cabbage, corn salsa, carrots, green onion should be added for the full effect). Thank you so very much for posting! I look forward to trying your other recipes!